Scientists announced today (March 17) that they have likely found the long-sought smoking gun for the theory of cosmic inflation, suggesting that the universe did indeed expand at many times the speed of light just after the Big Bang. Space.com: So astronomers have apparently found the signature of primordial gravitational waves in the CMB, which would pretty much confirm the theory of inflation. What's your reaction? Wilson: Well, it's amazing to me that people can dig something out that's a tenth of a part per million of the cosmic background, especially given a lot of foreground that might get in the way. So when you first detected the CMB back in 1964, you didn't imagine that scientists would be able to dig so much information out of it? No, we did not at the time. It only came out slowly over time. And the other thing which strikes me at this point is that — I believe it was 1980, when Alan Guth proposed inflation, with all of the flatness and homogeneity and whatever else, isotropy. And as things have gone on, one by one the predictions of inflation have been found. I guess this is sort of the last big one. It seems that scientists are getting a pretty good idea about what actually happened around the time of the universe's birth 13.8 billion years ago. That's amazing when you think about it. It is amazing. I guess one can't rule out some other theory coming that does as well or better, but it's just amazing that inflation has worked as well as it has. The new discovery, if it holds up, doesn't just confirm that inflation actually occurred — it also tells us some of the details of the process, right? Right. In fact, there are more parameters to inflation than I might like. And also, certainly, both the BICEP [Background Imaging of Cosmic Extragalactic Polarization] group [which announced the discovery today], which is going on to better instrumentation, and other groups will confirm this and improve it. That'll probably refine some of the parameters, which will help define dark energy and whatever. So what's the next big frontier? What else can we get out of the CMB, and what will people be looking for now? I don’t remember the names of the parameters, but there is a parameter of dark energy which might separate it from Einstein's cosmological constant. At this point, it appears to be quite close to what the cosmological constant would predict. We're now 50 years on from the discovery of the CMB. How does it feel to look back on the find, and think about how much it has contributed to our understanding of the universe? 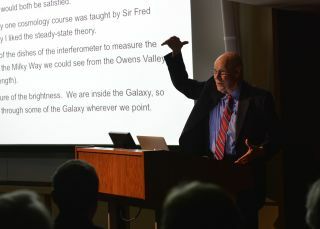 It's wonderful to have had the opportunity to do that, and to have gotten into cosmology and radio astronomy at a point where cosmology, anyway, was not a very interesting science. There were only a couple of parameters, and they were not well known at all. And to watch all of this evolve into what people I guess call "precision cosmology" — it's just amazing. I never expected all of this. And I feel extremely lucky that I was able to work at Bell Labs and use their technology for astronomy, and that it turned out to be so significant. Did you know at the time what you were onto? Was there a big 'a-ha!' moment when you realized you had discovered something monumental, or did it slowly dawn on you? I would say it slowly dawned on us. I guess neither of us took this cosmology too seriously to start with. In fact, we wanted to leave it open for the steady-state people to propose something to explain this. But clearly that didn't happen — although I think Fred Hoyle went to his grave thinking steady state could be saved. So right at first, we were extremely happy to have some sort of an explanation for what was going on. Three degrees out of 300 degrees surrounding us — it doesn't seem like much, but it was a serious deviation from what we could explain. It was certainly nice to have some explanation. I guess when Walter Sullivan wrote the piece in the New York Times on May 21, 1965, sort of breaking the story, I started thinking, "Well, maybe people are taking this cosmology thing seriously." But it was only slowly over the years that people proposed things you might find in the background radiation. At first, there was little more than just the expansion in there; the idea of all of this information coming out of it was sort of a combination of the technology getting better so that measurements could be better, and theorists working along and predicting new things.